Joanna Fox has created a food-lover's guide to Montreal restaurants where you can bring your own bottle. She recommends sixty restaurants that reflect the diversity and quality of a city where good food is respected-and expected. 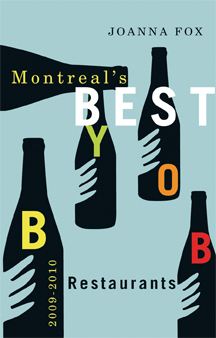 As Montreal's only BYOB guide, it will become indispensable for Montrealers and visitors alike. Joanna Fox has a Masters Degree in Gastronomy from Le Cordon Bleu school in Adelaide, South Australia. She currently lives in Montreal where she is a freelance writer.